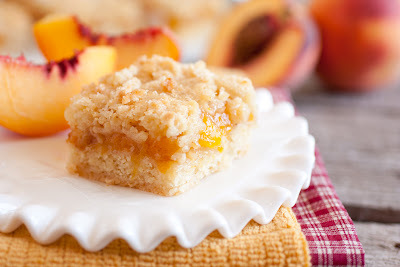 Peach cobbler meet sugar cookies meets crumb cake to create one delicious Peach Crumb Bar. These summer inspired dessert bars are loaded with fresh, sweetly spiced, juicy peaches and will quickly remind you of your favorite peach cobbler. 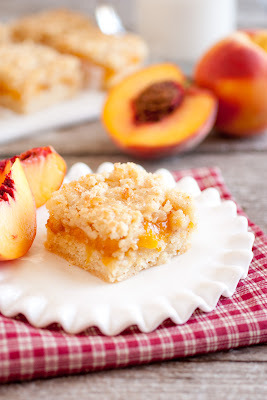 Their texture is soft yet crumbly, moist (thanks to all the juice from the peaches) and slightly cake-y. 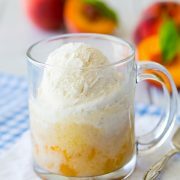 I would highly recommend eating them warm because it’s like peach pie or cobbler, it’s just not near as good cold. These are excellent when paired with a scoop of vanilla ice cream but they are also amazing all on their own. Enjoy! Oh, and you’re going to want that corner piece =), it’s my favorite. Sweet and crisp buttery cookie bars filled with a tempting peach filling. The perfect summer treat! Preheat oven to 375 degrees. In a small mixing bowl, whisk together 3/4 cup granulated sugar, cornstarch, cinnamon, nutmeg and ginger. 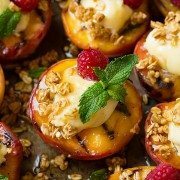 In a large mixing bowl, toss peaches with orange juice and optional orange zest. 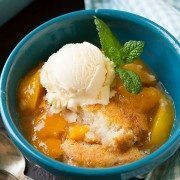 Sprinkle sugar mixture over peach mixture and toss to evenly coat, set aside. In a separate large mixing bowl, whisk together flour, baking powder and salt. Cut butter into flour mixture with a fork or pastry cutter until mixture resembles coarse crumbs. In a small bowl, whisk together egg, sour cream and vanilla extract. Pour egg mixture into flour mixture and stir until well combine. Add in remaining 1 cup granulated sugar and stir until combine. Spread and press half of crumb mixture into an even layer in a greased 13x9 inch baking dish. Toss peach mixture once more and pour over bottom crumb layer and spread peaches into an even layer (spread juices evenly too). 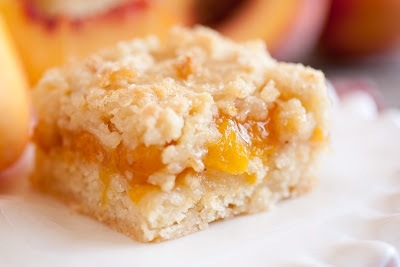 Sprinkle remaining crumb mixture over top of peaches into an even layer. Sprinkle top evenly with optional Turbinado sugar. Bake in preheated oven 45-50 minutes until golden. 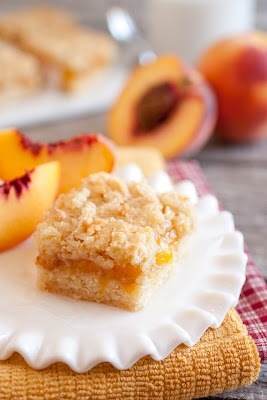 Serve warm with optional vanilla ice cream or allow to cool and cut into bars (Note: I prefer these bars warm but you could also serve them cold with sweetened whipped cream). Store bars in an airtight container in the refrigerator.